Is the Record Stock Buyback a Troubling Sign for Continued Economic Expansion? After nine years of bull market, it is not a surprise that stocks have become quite expensive. The Shiller PE, which compares companies’ share prices with their 10-year earnings average that is used to smooth the cyclical effect, is traded at 33, well above the historical average of 16. Trade wars, rising interest rates and inflation add to the worries about market’s health. Investors have become less enthusiastic about buying more stocks. Yet, there is one group buying shares with zest: the companies themselves. Companies in the S&P 500 Index repurchased $347 billion of their own shares in the first two quarters of 2018, a record pace on track to $700 billion this year (see Figure 1). TrimTabs Investment Research, which tracks all the buyback transactions, estimated that the total repurchases for all US companies could reach $1 trillion this year, a new record. The Trump tax cut has created a windfall for businesses, especially large corporations. The new tax law reduced the corporate tax rate to 21% from 35%. It also offered a tax break on foreign profit repatriation. A strong economy and solid revenue growth, combined with a large tax cut is fueling record profits. Corporate executives have chosen to use a big part of the cash flow to repurchase shares and reward shareholders. The long-held conventional wisdom is buybacks are bad for the US economy. The argument goes: although they may boost the share prices in the short term, share repurchases normally hurt the long-term business value and potentially economic growth. Why? Share repurchases may inflate short-term earnings per share, thus increasing share prices for the benefit of short-term traders like hedge fund managers or corporate executives (“short-timers”). However, they may hurt long-term shareholder value by allowing the “short-timers” to take away corporate cash that could otherwise have been invested on R&D, workers, or expansion that could help the continued success and growth of the business. The recent research by Olenick and Ayres (“Share Buybacks Are Corporate Suicide”) may support that argument. They examined 1,839 public companies in the US and found “the more money a firm spends on buybacks, the less likely it is to grow over the long-term. In fact, … we discovered that not only do buybacks not lead to growth in a company’s market value, they are strongly correlated to a declining market value.” Share buybacks do not help the companies themselves in the long run. However, this is only one part of the story. 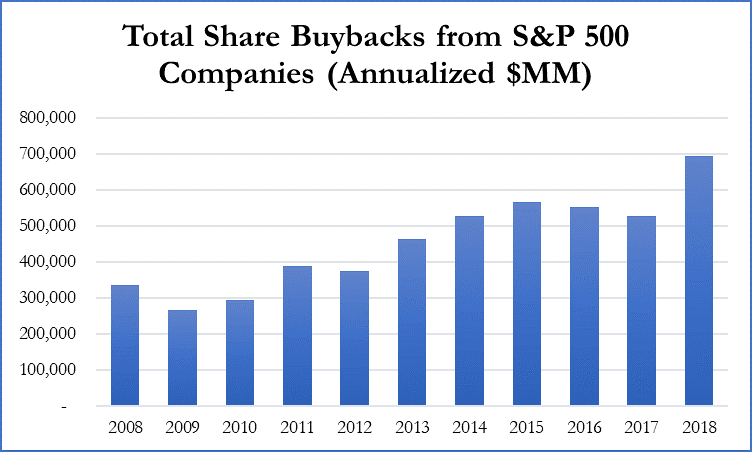 Share repurchases may hurt the long-term growth and shareholder value for the companies that buy back their stocks, but they may not be bad for the economy as a whole. First of all, the companies buying back shares may be mature companies with low growth prospects in the first place. Returning cash to shareholders could be the best use of the corporate money among all the available options. Secondly, if the companies cannot find good investment opportunities for the corporate cash, buybacks could provide resources for shareholders themselves to find better investment opportunities outside the companies. In this case, share repurchases are not necessarily bad for the economy because they help allocating resources more efficiently. Ultimately, it will depend on how the shareholders who benefit from the buybacks use the extra cash. If those shareholders invest the extra cash in innovations or other growth companies, share buybacks could help the economic expansion in the long run.